Some thought the single Imperial status of "British subject" was becoming increasingly inadequate to deal with a Commonwealth with independent member states. In 1948, the Commonwealth Heads of Government agreed that each member would adopt a national citizenship (Canada had already done so), but that the existing status of the British subject would continue as a common status held by all Commonwealth citizens. Between 1962 and 1971, as a result of fears about increasing immigration by Commonwealth citizens, the UK gradually tightened controls on immigration by British subjects from other parts of the Commonwealth, which included CUKCs without familial or residential ties to the UK. The Immigration Act 1971 introduced the concept of patriality, by which only British subjects (i.e., CUKCs and Commonwealth citizens) with sufficiently strong links to the British Islands (e.g., being born in the islands or had a parent or a grandparent born there) had right of abode, meaning they were free from immigration control and had the right to enter, live and work in the islands. The act, therefore, had de facto created two types of CUKCs: those with right of abode in the UK, and those without right of abode in the UK (who might or might not have right of abode in a Crown colony or another country). Despite differences in immigration status was formally created, there existed no de jure difference between the two under the nationality context, as the 1948 law still specified one tier of citizenship throughout the UK and its colonies. This changed in 1983 when the 1948 law was replaced by a multi-tier nationality system. The current principal British nationality law in force, since 1 January 1983, is the British Nationality Act 1981, which established the system of multiple categories of British nationality. To date, six tiers were created, viz. British citizens, British Overseas Territories citizens, British Overseas citizens, British Nationals (Overseas), British subjects, and British protected persons. Only British citizens and certain Commonwealth citizens have the automatic right of abode in the UK, with the latter holding residual rights they had prior to 1983. Aside from different categories of a nationality, the 1981 Act also ceased to recognise Commonwealth citizens as British subjects. There remain only two categories of people who are still British subjects: those (formerly known as British subjects without citizenship) who acquired British nationality through a connection with former British India, and those connected with the Republic of Ireland before 1949 who have made a declaration to retain British nationality. British subjects connected with former British India lose British nationality if they acquire any other. In spite of the fact that the 1981 act repealed most of the provisions of the 1948 act and the nationality clauses in subsequent independence acts, the acquisition of new categories of British nationality created by the 1981 act was often dependent on nationality status prior to 1 January 1983, the date the 1981 act came into effect, so many of the provisions of the 1948 act and subsequent independence acts are still relevant. Not taking this into account might lead one to the erroneous conclusion, for example, that the 1981 act's repeal of the nationality clauses in the Kenya Independence Act of 1963 restored British nationality to those who lost their CUKC status as a result of Kenya's independence in 1963. This is one of the reasons for the complexity of British nationality law; in complicated cases, determining British nationality status requires an examination of several nationality acts in their original form. There are currently six classes of British nationality. The following two classes of British nationality are "active", meaning that they can be acquired at birth, or by naturalization or registration for any eligible person. Persons who are British citizens usually hold this status through a connection with the United Kingdom, Channel Islands and Isle of Man ("United Kingdom and Islands"); the Falkland Islands; or, since 2002, a connection with one of the remaining British Overseas Territories (BOT) except Akrotiri and Dhekelia. Citizens of the United Kingdom and Colonies (CUKCs) who possessed right of abode under the Immigration Act 1971 through a connection with the UK and Islands generally became British citizens on 1 January 1983. This status was also retroactively extended to British Dependent Territories citizens with a connection to the Falkland Islands on 28 March 1983, while the remaining British Dependent Territories citizens who were not solely connected with Akrotiri and Dhekelia acquired the status on 21 May 2002. BOTC (formerly BDTC) is the form of British nationality held by connection with any British Overseas Territory (BOT). It is possible to hold BOTC and British citizenship simultaneously. Nearly all are now also British citizens as a result of the British Overseas Territories Act 2002. The four residual categories are expected to become extinct with the passage of time. They can be passed to children only in exceptional circumstances, e.g., if the child would otherwise be stateless. There is consequently little provision for the acquisition of these classes of nationality by people who do not already have them. To reduce de facto statelessness, most are allowed to be registered as British citizens provided holding no other citizenship or nationality. In general, most BOCs are CUKCs who did not qualify for British citizenship or British Dependent Territories citizenship. Most derived their status as CUKCs from former colonies, such as Malaysia and Kenya, because of quirks and exceptions in the law that resulted in their retaining CUKC status in spite of the independence of their colonies. This is fairly uncommon: most CUKCs (including those from Malaysia and Kenya) lost their CUKC status upon independence. In 1997, BDTCs with a connection to Hong Kong became BOCs if they did not register as British Nationals (Overseas) and would have become stateless after the withdrawal of BDTC status from Hong Kong residents. The status of BN(O) was created by the Hong Kong Act 1985 and the British Nationality (Hong Kong) Order 1986. BN(O)s are BDTCs with a connection to Hong Kong who applied for registration as BN(O)s before the handover of Hong Kong to the People's Republic of China. Only the status of British citizen carries with it the right of abode in a certain country or territory (in this case the UK). In practice, BOTCs (except those associated with the Sovereign bases in Cyprus) were granted full British citizenship in 2002; BN(O)s have right of abode or right to land in Hong Kong (note: not conferred by the status itself, but the Immigration Ordinance of Hong Kong) and are eligible for registration as British citizens if holding no other nationality under the Borders, Citizenship and Immigration Act 2009; BSs and BPPs lose their statuses upon acquisition of another nationality (except BSs connected with the Republic of Ireland) and so should be eligible for registration as British citizens under the Nationality, Immigration and Asylum Act 2002. British Overseas citizens are unique in that their nationality status is not associated with a right of residence, and only certain types of BOCs are eligible to be registered as British citizens under Nationality, Immigration and Asylum Act 2002. Persons acquiring citizenship by method (2) are called British citizens by descent; those acquiring citizenship by methods (1), (3) or (5) are called British citizens otherwise than by descent. British citizens by registration, method (4), may be either, depending on the circumstances. Only citizens otherwise than by descent can pass on their citizenship to their children born outside the UK or a British Overseas Territory automatically; British citizens by descent can pass on citizenship to their non-UK born children only by meeting certain UK residence requirements and registering them before the age of 18. From 1 January 1983, a child born in the UK or the Falkland Islands to a parent who is a British citizen or 'settled' in the UK or the Falkland Islands is automatically a British citizen by birth. This provision is extended to children born to such parents in any remaining British Overseas Territory other than Akrotiri and Dhekelia after 21 May 2002. Since 13 January 2010, a child born to a parent who is a member of the British Armed Forces at the time of birth also automatically acquires British citizenship if he or she was born in the UK or a qualified British Overseas Territory. 'Settled' status usually means the parent is resident in the UK or a British Overseas Territory and has the right of abode (or similar status), or holds Indefinite Leave to Remain (ILR), or is the citizen of an EU/EEA country and has permanent residence, or otherwise unrestricted by immigration laws to remain in the UK or that Overseas Territory. Irish citizens in the UK are deemed settled for this purpose. To qualify under the armed forces provision, the parent must be a member of the armed forces at the time of the child's birth. Where, after the child's birth, a parent subsequently acquires British citizenship or "settled" status, the child can be registered as a British citizen using Form MN1 provided he/she is aged under 18. If the child lives in the UK until the age of 10, there is a lifetime entitlement to register as a British citizen using Form T. The immigration status of the child and his/her parents is irrelevant. During each of the first 10 years of the child's life, he/she must not have spent over 90 days outside the UK (unless there were 'special circumstances'). The applicant must be of good character at the time the application is made. A child born in the United Kingdom who is and has always been stateless may also qualify on the basis of a period of 5, rather than 10, years residence, using Form S3. Even if a child born in the UK on or after 1 January 1983 but does not acquire British citizenship at birth, the child is considered a lawful resident in the UK and is not required to apply for leave to remain. The child, however, is subject to immigration control and the child's parent(s) can choose to apply for regularisation of the child's immigration status by the grant of leave to remain (for the same period as that held by the parent(s)). If the child leaves the UK, he/she must hold leave to enter or remain in order to return to the UK. 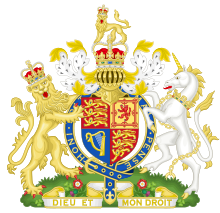 Between 1949 and 1982, birth in the UK or a Crown Colony was sufficient in itself to confer the status of Citizen of United Kingdom and Colonies (CUKC) irrespective of the status of parents, although only CUKCs with a connection to the UK (i.e., birth in the UK or has a UK-born parent or grandparent) would have right of abode in the UK after 1971 and would eventually become British citizens in 1983. CUKCs without a connection to the UK would become either British Overseas Territories citizens or British Overseas citizens in 1983 depending on whether they have a connection with another BOT. The only exception to this rule were children of diplomats and enemy aliens. This exception did not apply to most visiting forces, so, in general, children born in the UK before 1983 to visiting military personnel (e.g. US forces stationed in the UK) were CUKCs connected with UK and would become British citizens in 1983, albeit as a second nationality. "British citizenship by descent" is the category for the children born outside the UK or an Overseas Territory to a British citizen. Rules for acquiring British citizenship by descent depend on when the person was born. A child born outside the UK, Gibraltar or the Falkland Islands on or after 1 January 1983 (or outside another British Overseas Territory on or after 21 May 2002) automatically acquires British citizenship by descent if either parent is a British citizen otherwise than by descent at the time of the child's birth. As a general rule, an unmarried father cannot pass on British citizenship automatically in the case of a child born before 1 July 2006. If the parents marry subsequent to the birth the child normally becomes a British citizen at that point if legitimated by the marriage and the father was eligible to pass on British citizenship. If the unmarried British father was domiciled in a country that treated (at the date of birth of the child born before 1 July 2006) a child born to unmarried parents in the same way as a child born to married parents, then the father passed on British citizenship automatically to his child, even though the child was born before 1 July 2006 to unmarried parents. Such countries are listed in the UK Home Office Immigration and Passport Services publication "Legitimation and Domicile". Before 21 May 2002, all British Overseas Territories except two were treated as 'overseas' for nationality purposes. The exceptions were Gibraltar, where residents are eligible to register as British citizens under section 5 the British Nationality Act 1981; and the Falkland Islands, granted British citizenship following the Falklands War under the British Nationality (Falkland Islands) Act 1983. Hence, children born to such parents on a British Overseas Territory other than those listed above acquired British citizenship by descent if they were born prior to 21 May 2002, while children born on or after that day on a British Overseas Territory (other than Akrotiri and Dhekelia) acquired British citizenship otherwise by descent as UK-born children. In exceptional cases, the Home Secretary may register a child of parents who are British by descent as a British citizen under discretionary provisions, for example if the child is stateless, or a second or subsequent generation born abroad into a British citizen family with strong links with the UK, or in 'compassionate circumstances'. In 1979 the Home Office had begun to take quiet steps to address this gender discrimination by allowing British citizen mothers to register children born abroad at the local British consulate within one year of birth, just as British citizen fathers could. However, the change was without great publicity and was largely unnoticed, and in 2002, Parliament formalized the approach in law, by enacting amendments to the British Nationality Act 1981 allowing children who had been covered by the 1979 procedural change (because they were under 18 years old at that time) to register themselves at any point later in life. The class of eligible registrants was later expanded in 2009, and was upheld by a 2018 UK Supreme Court ruling. Several laws also accorded a right of registration to children born of unmarried British citizen fathers. Children born outside the UK before 1 January 1983 to a CUKC mother who became a British citizen on 1 January 1983 and a foreign father are not British citizens by birth, and neither are children born between 1 January 1983 to 1 July 2006 to a British citizen father and a foreign mother out of wedlock. The Nationality, Immigration and Asylum Act 2002 inserted a section 4C into the British Nationality Act 1981 allowing for registration as a British citizen of any person born between 7 February 1961 and 1 January 1983 who would have become a CUKC if the British Nationality Act 1948 had provided for mothers to transmit citizenship in the same way that fathers could. The Borders, Citizenship and Immigration Act 2009 then expanded the earliest date of birth covered from 1961 to 1 January 1949, and elaborated in "a dense and at times impenetrable piece of drafting" on the section's approach, while also covering numerous additional and less common situations, and adding a good character requirement. Alternatively, if already resident in the UK, these children may seek naturalisation as a British citizen, which gives transmissible British citizenship otherwise than by descent. Under section 5 of the Ireland Act 1949, a person who was born in the territory of the future Republic of Ireland as a British subject, but who did not receive Irish citizenship under the Ireland Act's interpretation of either the 1922 Irish constitution or the 1935 Irish Nationality and Citizenship Act (because he or she was no longer domiciled in the Republic on the day the constitution came into force and was not permanently resident there on the day of the 1935 law's enactment and was not otherwise registered as an Irish citizen) was deemed to be a Citizen of the United Kingdom and Colonies. by registration, at any time in life, with Form UKM, of birth to a citizen mother between the BNA 1948 and the BNA 1981 effective dates, under the UK Supreme Court's 2018 Romein principle. In some cases, British citizenship may be available to these descendants in the Irish diaspora when Irish citizenship registration is not, as in instances of failure of past generations to timely register in a local Irish consulate's Foreign Births Register before the 1986 changes to Irish nationality law and before births of later generations. Any person who obtains British nationality by this method is British otherwise than by descent, which means they have the same status as those born or naturalised in the UK and can pass on British nationality to their children. Have held indefinite leave to remain in the UK (or an "equivalent" (for this purpose) such as the right of abode, Irish citizenship, or permanent residency as a citizen of an EU/EEA country or a family member of one) at the time they apply for naturalisation. As of 12 November 2015, EEA nationals are explicitly required to obtain a proof of permanent residency in the UK (in the form of permanent residency certificate) if they are to become a British citizen by naturalisationProof of permanent residence is obtained by completing form EEA (PR) for Home Office approval. show sufficient knowledge of life in the UK, either by passing the Life in the United Kingdom test or by attending combined English language and citizenship classes. Proof of this must be supplied with one's application for naturalisation. Exemption from this and the language requirement (see below) is normally granted for those aged 65 or over, and may be granted to those aged between 60 and 65. Note that this is required for permanent residency, not just for citizenship, and married partners may be deported if they are unable to pass the test. [dubious – discuss] The test has attracted controversy for being "like a bad pub quiz" and the subject of a critical, comprehensive report by Thom Brooks. As of 11 February 2009[update], wait times for naturalisation applications were reportedly up to 6 months. The UK Border Agency stated that this was occurring because of the widespread changes proposed to the immigration laws expected to take effect in late 2009. In 2013 the fee for a single applicant increased to £874. In 2014 the fee for a single applicant increased to £906. In 2015 the fee for a single applicant increased to £1005. In 2016 the fee for a single applicant increased to £1236. In 2017 the fee for a single applicant increased to £1282. In 2018 the fee for a single applicant increased to £1330. Because of section 2(1) of the Ireland Act 1949 (which states that the Republic of Ireland would not be treated as a foreign country for the purposes of British law), Irish citizens are exempt from these restrictions and are normally treated as "settled" in the UK immediately upon taking up residence. This status may be threatened by Brexit, according to an untested [in court] legal opinion. Registration is a simpler method of acquiring citizenship than naturalisation, but only certain people holding a form of British nationality or having a connection to the UK are eligible. In general, language proficiency and knowledge requirements do not apply to applicants for registration. BOTCs who acquired their citizenship after 21 May 2002 (except for those connected solely with the Akrotiri and Dhekelia) may request registration under section 4A of the 1981 Act without further conditions other than the good character requirement. Registration under section 4A grants citizenship otherwise than by descent. Those connected with Gibraltar may also elect to apply for registration under section 5 of the 1981 Act which grants citizenship by descent. This confers citizenship otherwise than by descent. However, BOTCs solely connected with Akrotiri and Dhekelia are not eligible for registration and must apply for naturalization instead. Naturalization also grants citizenship otherwise than by descent. The Home Secretary can exercise discretion under section 3(1) of the 1981 Act and register any child as a British citizen even if they may not meet the formal criteria. Certain adopted children would also be registered under this provision if their adoptions were not made in accordance with the Hague Convention. Registration under section 3(1) confers citizenship otherwise than by descent if neither parent was a British citizen at the time of registration, or by descent if either parent was a British citizen at that time. The British Nationality Act 1981 contains provisions for acquisition and loss of British Dependent Territories citizenship (BDTC) (renamed British Overseas Territories citizenship (BOTC) in 2002) on a similar basis to those for British citizenship. The Home Secretary has delegated his powers to grant BOTC to the Governors of the Overseas Territories. Only in exceptional cases is a person naturalised as a BOTC by the Home Office in the UK. It is unusual for a person to be able to acquire British Overseas citizenship, British subject or British protected person status. They are not generally transmissible by descent, nor are they open to acquisition by registration, except for certain instances to prevent statelessness. It is also not possible for any person to acquire British National (Overseas) status as the registration period for such status had permanently ended on 31 December 1997. The Nationality, Immigration and Asylum Act 2002 granted British Overseas Citizens, British Subjects and British Protected Persons the right to register as British citizens if they have no other citizenship or nationality and have not after 4 July 2002 renounced, voluntarily relinquished or lost through action or inaction any citizenship or nationality. Previously such persons would have not had the right of abode in any country, and would have thus been de facto stateless. Despite strong resistance from senior officials at the Home Office, the then Home Secretary, David Blunkett, said on 3 July 2002 that this would "right a historic wrong" that left stateless tens of thousands of Asian people who had worked closely with British colonial administrations. This provision was extended to British Nationals (Overseas) in 2009. After the withdrawal of BDTC status from all BDTCs by virtue of a connection with Hong Kong on 30 June 1997, most of them are now either British Nationals (Overseas) and/or British citizens (with or without nationality of China), or Chinese nationals only. The remaining few became British Overseas citizens. Before the handover in 1997, former BDTCs from Hong Kong had been able to acquire British citizenship under legislation passed in 1990, 1996 and 1997. In other cases, certain persons may already hold British citizenship as a matter of entitlement or through registration under normal procedures. Although it is no longer possible to acquire British National (Overseas) status after 31 December 1997, stateless children born to such parents are entitled to British Overseas citizenship and can subsequently apply to register as British citizens under the Nationality, Immigration and Asylum Act 2002. Since 2009, BN(O)s without other nationalities or citizenship are able to register as British citizens under the Borders, Citizenship and Immigration Act 2009 as well. British citizens and BN(O)s who are of full or partial Chinese descent are also Chinese nationals under Chinese law unless they have renounced their Chinese nationality with the Hong Kong SAR Government. As China does not recognise multiple nationality, those persons are considered by China as solely Chinese nationals before and after the handover of Hong Kong and hence are not eligible for consular protection when on Chinese soil. Although holding the same nationality under the Chinese nationality law, Chinese nationals with a connection to Hong Kong or Macau have been categorised differently from Chinese nationals domiciled in Mainland China. Renunciations made to other authorities (such as the general renunciation made as part of the US naturalisation ceremony) are not recognised by the UK. The forms must be sent through the UK Border Agency's citizenship renunciation process. There are provisions for the resumption of British citizenship or British overseas territories citizenship renounced for the purpose of gaining or retaining another citizenship. This can generally only be done once as a matter of entitlement. Further opportunities to resume British citizenship are discretionary. British Overseas citizens (BOCs) do not lose their BOC status upon acquisition of another citizenship, but any entitlement to registration as a British citizen on the grounds of having no other nationality no longer applies after acquiring another citizenship. After the Nationality, Immigration and Asylum Act 2002 came into force British nationals could be deprived of their citizenship if and only if the Secretary of State was satisfied they were responsible for acts seriously prejudicial to the vital interests of the United Kingdom or an Overseas Territory. This was extended under the Immigration, Asylum and Nationality Act 2006; people with dual nationality who are British nationals can be deprived of their British citizenship if the Secretary of State is satisfied that "deprivation is conducive to the public good", or if nationality was obtained by means of fraud, false representation or concealment of a material fact. There is a right of appeal. This provision has been in force since 16 June 2006 when the Immigration, Nationality and Asylum Act 2006 (Commencement No 1) Order 2006 came into force. Loss of British nationality in this way applies also to dual nationals who are British by birth. The Secretary of State may not deprive a person of British nationality, unless obtained by means of fraud, false representation or concealment of a material fact, if they are satisfied that the order would make a person stateless. This provision was modified by the Immigration Act 2014 so as not to require that a third country would actually grant nationality to a person; British nationality can be revoked if "the Secretary of State has reasonable grounds for believing that the person is able, under the law of a country or territory outside the United Kingdom, to become a national of such a country or territory." The powers to strip citizenship were initially very rarely used. Between 2010 and 2015, 33 dual nationals had been deprived of their British citizenship. In the two years to 2013 six people were deprived of citizenship; then in 2013, 18 people were deprived, increasing to 23 in 2014. In 2017, over 40 people had been deprived as of July (at this time increased numbers of British citizens went to join "Islamic State" and then tried to return). The Home Office does not issue information on these cases and is resistant to answering questions, for example under the Freedom of Information Act 2000. It appears that the government usually waits until the person has left Britain, then sends a warning notice to their British home and signs a deprivation order a day or two later. Appeals are heard at the highly secretive Special Immigration Appeals Commission (SIAC), where the government can submit evidence that cannot be seen or challenged by the appellant. Home Secretary Sajid Javid said in 2018 that until then deprivation of nationality had been restricted to "terrorists who are a threat to the country", but that he intended to extend it to "those who are convicted of the most grave criminal offences". The acting director of Liberty responded “The home secretary is taking us down a very dangerous road. ... making our criminals someone else’s problem is ... the government washing its hands of its responsibilities ... Banishment belongs in the dark ages." As of August 2018[update], there is no restriction in UK law on a British national holding in addition citizenship of other countries; indeed the Good Friday Agreement explicitly recognises the right of qualified residents of Northern Ireland to be British, Irish, or both. Different rules apply to British protected persons and certain British subjects (that do not apply to British citizens). A person who is a British subject other than by connection with the Republic of Ireland loses that status on acquiring any other nationality or citizenship, and a British protected person ceases to be such on acquiring any other nationality or citizenship. Although British Overseas citizens are not subject to loss of citizenship, British Overseas citizens may lose an entitlement to register as a British citizen under s4B of the 1981 Act if they acquire any other citizenship. A number of other countries do not allow multiple citizenship. If a person has British nationality and is also a national of a country that does not allow dual nationality, the authorities of that country may regard the person as having lost that nationality or may refuse to recognise the British nationality. British nationals who acquire the nationality of a country that does not allow dual nationality may be required by the other country to renounce British nationality to retain the other citizenship. None of this affects a person's national status under UK law. A British subject who acquired foreign citizenship by naturalisation before 1949 were deemed to have lost his or her British subject status at the time. No specific provisions were made in the 1948 legislation for such former British subjects to acquire or otherwise resume British nationality, and hence such a person would not be a British citizen today. However, women who lost British nationality on marriage to a foreign man before 1949 were deemed to have reacquired British subject status immediately before the coming into force of the 1948 act. 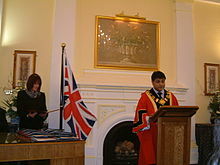 A British citizenship ceremony in the London Borough of Tower Hamlets, 2005.
have become citizens of the European Union under European Union law and enjoy rights of free movement and the right to vote in elections for the European Parliament. When in a non-EU country where there is no British embassy, British citizens have the right to get consular protection from the embassy of any other EU country present in that country. British citizens can live and work in any country within the EU as a result of the right of free movement and residence granted in Article 21 of the EU Treaty. Visa requirements for British citizens are administrative entry restrictions by the authorities of other states placed on citizens of the United Kingdom. In 2017, British citizens had visa-free or visa on arrival access to 173 countries and territories, ranking the British passport 4th in terms of travel freedom (tied with Austrian, Belgian, Dutch, French, Luxembourgish, Norwegian and Singaporean passports) according to the Henley visa restrictions index. Additionally, the World Tourism Organization also published a report on 15 January 2016 ranking the British passport 1st in the world (tied with Denmark, Finland, Germany, Italy, Luxembourg and Singapore) in terms of travel freedom, with a mobility index of 160 (out of 215 with no visa weighted by 1, visa on arrival weighted by 0.7, eVisa by 0.5, and traditional visa weighted by 0). ^ British Overseas Territories Act 2002, c.8. ^ "Naturalisation Booklet – The Requirements" (PDF). ^ "Types of British nationality". UK Government. Retrieved 7 September 2015. ^ "Register as a British Citizen - Stateless People". Gov.uk. Retrieved 10 August 2014. ^ a b c d "Register as a British citizen - GOV.UK". ^ "UK Government - UK Visas and Immigration: Guidance on registering a stateless person born in the UK or a British overseas territory on or after 1 January 1983 as a British citizen or a British overseas territories citizen using form S3" (PDF). www.gov.uk. ^ "Immigration Directorates' Instructions, Chapter 08, Section 4A (Children born in the United Kingdom who are not British citizens)" (pdf). Home Office. November 2009. ^ "Immigration Rules, paragraphs 304-309". Home Office. ^ "Home Office Nationality Instructions (Chapter 9: Registration of Minors at Discretion), Section 9.12" (PDF). ^ UK Parliament. Nationality, Immigration and Asylum Act 2002 as amended (see also enacted form), from legislation.gov.uk. ^ "U.S. woman wins appeal against 'unlawful' decision to refuse British citizenship". Scottish Legal News Ltd. 4 April 2016. Retrieved 1 April 2019. ^ "newbook.book" (PDF). Retrieved 13 August 2010. ^ Khan, Asad (23 February 2018). "Case Comment: The Advocate General for Scotland v Romein (Scotland)  UKSC 6, Part One". UK Supreme Court Blog. ^ "British Nationality Act 1981 (c. 61) - Statute Law Database". Statutelaw.gov.uk. 5 December 2005. Retrieved 13 August 2010. ^ "British Nationality Act 1981 (c. 61) - Statute Law Database". Statutelaw.gov.uk. Retrieved 13 August 2010. ^ Michael Pumo. "New requirement for EEA British citizenship applicants". Smith Stone Walters. ^ Anne Morris. "EEA PR". DavidsonMorris. ^ "British citizenship test 'like bad pub quiz'". BBC News. ^ "Become a British Citizen". gov.uk. UK government. 10 June 2015. Retrieved 15 September 2015. ^ "British Nationality Act 1981, SCHEDULE 1, Naturalisation as a British citizen under section 6(1)". The National Archives. Retrieved 13 October 2015. ^ "Link to notice regarding wait times on the UK Border Agency website as of 11 February 2009". Ukba.homeoffice.gov.uk. Retrieved 13 August 2010. ^ "European Economic Area and Swiss nationals" (PDF). Immigration and Nationality Directorate, Home Office. ^ "Statutory Instrument 2000 No. 2326". Opsi.gov.uk. Retrieved 13 August 2010. ^ Quinn, Ben; Doward, Jamie (3 December 2017). "Brexit puts special rights for Irish citizens in UK 'at risk']". The Observer. ^ a b "Passport policy - Treaty Rights" (PDF). ^ "Guide B(OS) Registration as a British citizen" (PDF). Gov.uk. Home Office. Retrieved 21 November 2018. ^ "Legitimation and Domicile" (PDF). Gov.uk. Home Office. Retrieved 24 November 2018. ^ "Nationality policy: children of unmarried parents" (PDF). Gov.uk. Home Office. Retrieved 24 November 2018. ^ "Home Office Nationality instructions (Chapter 9: Registration of Minors at Discretion)" (PDF). ^ "Guidance: Intercountry adoption and British citizenship". Gov.uk. Home Office. Retrieved 24 November 2018. ^ "Letter from the Director of the INPD to the Home Secretary" (PDF). 19 June 2002. Retrieved 13 August 2010. ^ "UK | UK Politics | UK to right 'immigration wrong'". BBC News. 5 July 2002. Retrieved 13 August 2010. ^ "UK Border Agency | How do I give up British citizenship or another form of British nationality?". Bia.homeoffice.gov.uk. Retrieved 13 August 2010. ^ a b c d e Ian Cobain. "Obama's secret kill list – the disposition matrix". the Guardian. ^ "The Immigration, Asylum and Nationality Act 2006 (Commencement No. 1) Order 2006". Opsi.gov.uk. Retrieved 13 August 2010. ^ "Apply to the Special Immigration Appeals Commission - GOV.UK" (PDF). ^ "British Nationality Act 1981". UK Government. 40(2)(c). Retrieved 17 November 2018. ^ a b Jamie Grierson (7 October 2018). "Sajid Javid 'taking UK down dangerous road' by expanding citizenship stripping". The Obsever. Retrieved 7 October 2018. ^ Kamila Shamsie (17 November 2018). "Exiled: the disturbing story of a citizen made unBritish". The Guardian. Retrieved 17 November 2018. ^ "Deprivation of citizenship". WhatDoTheyKnow. ^ "Liste complète". Bureau des Traités. ^ "Recherches sur les traités". Bureau des Traités. ^ "United Kingdom". European Union. Retrieved 4 May 2015.